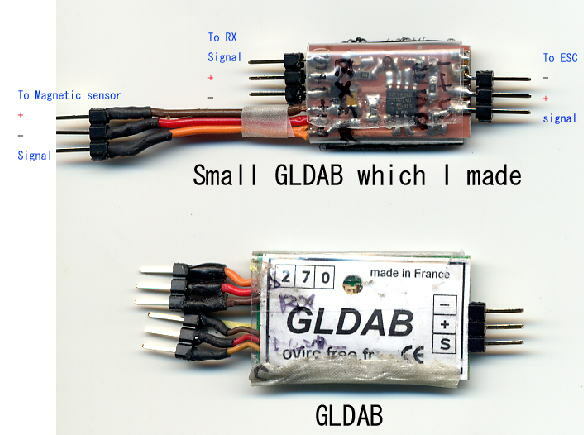 The GLDAB unit is intended for positioning the wings of an RC ornithopter into the gliding position. It works in conjunction with a mechanical ratchet. The unit should be inserted between the RX and the ESC. The magnetic detector connected to the unit is used to detect the stop position. 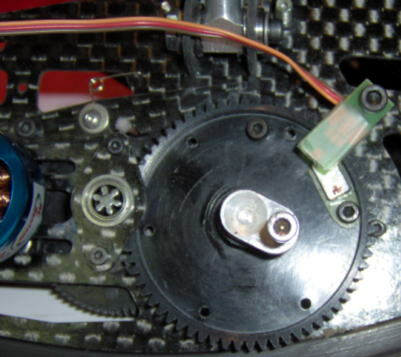 The magnet should be fixed onto the main gear of the mechanism. The magnetic detector and the magnet should be aligned when the mechanical ratchet is engaged. At first hang a ratchet on a screw of a gear and fix wings at a gliding position (see figure). 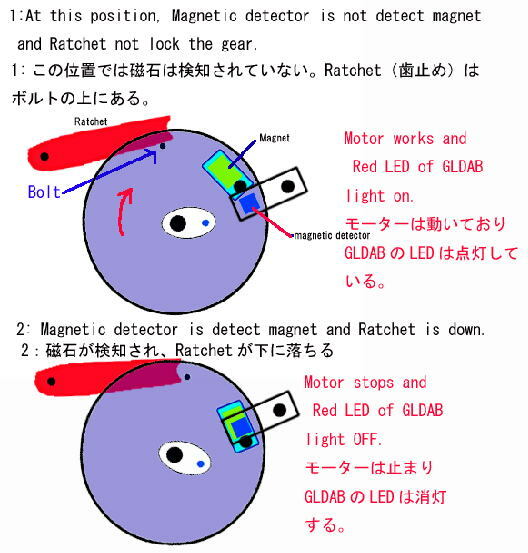 At this position, install a magnet detector and a magnet like a figure. The top of the detector (component side) should be mounted facing the magnet! Please regulate height so that the distance between the detector and the magnet become short as possible. At first you let your Ornithopter fly at low speed as much as possible. When gliding is ordered (throttle low), during one second, the motor works at a pre-selected low speed and stops when the magnet is detected, ensuring that the mechanical ratchet mechanism will engage and lock the wings. If the magnet still is not detected after 1 seconds, the motor shuts off. When the throttle is raised again, the glide sequence terminates and normal throttle control is restored. Set-up mode allows you to change the motor speed setting used to move the wings downward to the “locked” position. -->To enter set-up mode, set the throttle to "full" for 2 seconds, right after connecting the battery or turning on the RC system. LED blinking. -->Move throttle to "off" position for 2 seconds. LED ON. -->Move throttle to the desired motor speed setting. The LED will blink for 4 seconds. -->The selected motor speed is memorized at the end of these 4 seconds. This position becomes the most low velocity position in normal motor control (a motor rotation start at this position). Warning: If the selected speed is too low, the wings do not move to lock position, so, the wings will not lock. And your model will be put in jeopardy. Normal start-up is performed with throttle set to "off" position. The LED is ON for 2 seconds right after power on. 6. Wait more than 2 seconds -> Motor Run slow speed and LED repeat on-off for 4 seconds ->Set throttle position at that you wish for runnig motor speed while LED flashes on and off (It is usually OK at the lowest throttle position). When on and off of LED is end and Motor stops, Set position is memorized. After 1 second, Motor stops. Motor stops at Max low Position of Throttle. 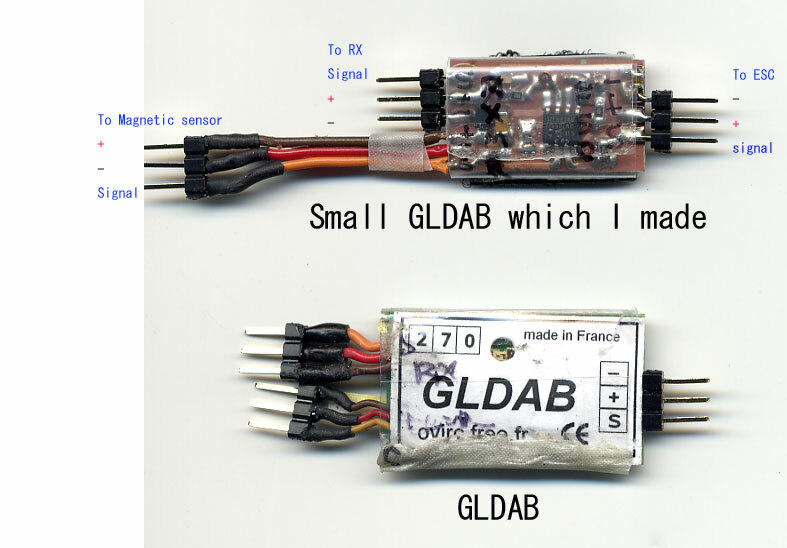 In order to achieve a successful glide lock, it is necessary to tune your controller/ESC accordingly. 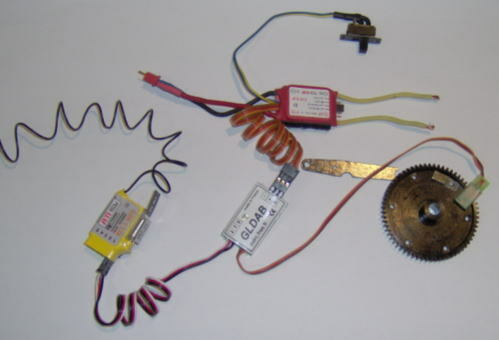 Speed in a gliding start, the strength of wind, a voltage fall of battery influence a position of a stop of a gear. If the wings not lock, try to setup “selected low motor speed” higher. 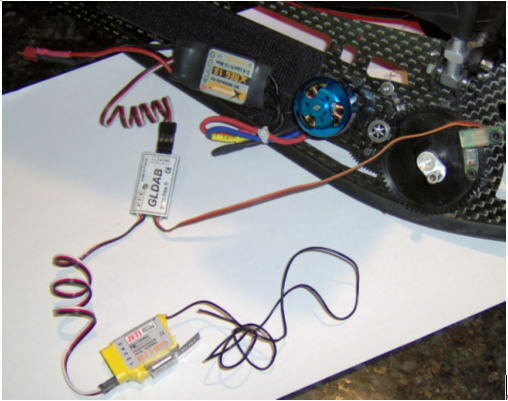 If in flight, the setuped low speed of the motor is too weak, then it is necessary to reprogram to stronger torque.